I confess that I did this photograph for a fashion shoot, but the form, the colour and the twisting diagonal reminds me of Brancusi’s famous sculpture. Whether or not I had “The Bird in Space” in mind when I set up the shot is a moot point. I studied art in my youth, I have taken an interest in art all my life, perhaps these things when not sought after, just bubble to the surface. The client, Sicilian designer Marella Ferrera, adores rummaging in Parisian flee markets for old lace, crinolines, ribbons and corsets which she throws together into her creazioni. Mina, the art director and I wanted to make an oblique image to harmonise with Ferrera’s off-beat, whimsical whirlpool of ideas. 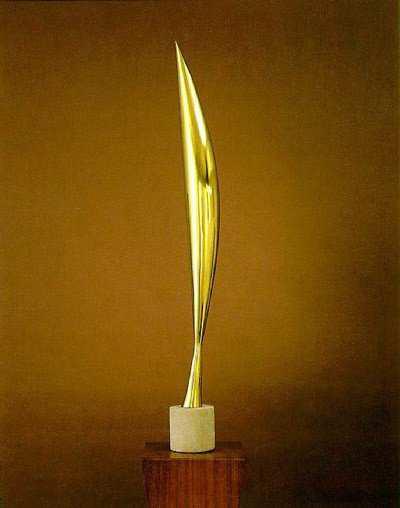 The Romanian Brancusi studied sculpture briefly under Rodin in Paris, but left after a couple of months memorably declaring, “Nothing can grow under big trees.” A wise move, for if Rodin sculpted things, Brancusi sculpted the essence of things, in this case a bird in flight. There are seven marble copies and nine bronzes; sculpture has something in common with printmaking, and photography – it is reproducible. Brancusi lived all his adult in France but maintained a life long yearning for his homeland, and besides, Romanian folk traditions were the source of his genius. He achieved great international fame in his middle years ensuring him financial stability and liberty of expression, but rather like his contemporary Sibelius who also lived a long life, fame led to retirement, introspection and inactivity for twenty odd years. “Bird in Space” became something of a cause ce/ebre when it was imported into the US in 1926 as it was not recognised as a work of art, so a whopping 40% duty of $4,000 was levied: quite why they thought a 5ft long brass spike embedded in a rock should be worth as much as $10,000 is curious in itself. The art world was outraged, the artist appealed, the duty was waived, the work of art redeemed. I entered this photograph into the annual Awards run by the Association of Photographers in London in the Fashion Section. The last time I was selected for an award was in far off 1993, but this time I felt I had a winner. It passed unrecognised by the judges, I resigned, end of an era, another tie severed with the old country.